Home / Solar Energy / Govt. 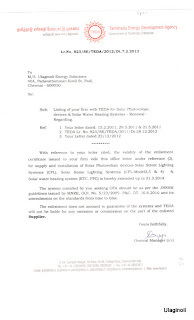 of Tamil Nadu Enterprise – TEDA Enlistment of Ulaginoli Energy Solutions extended till 31 March 2014. 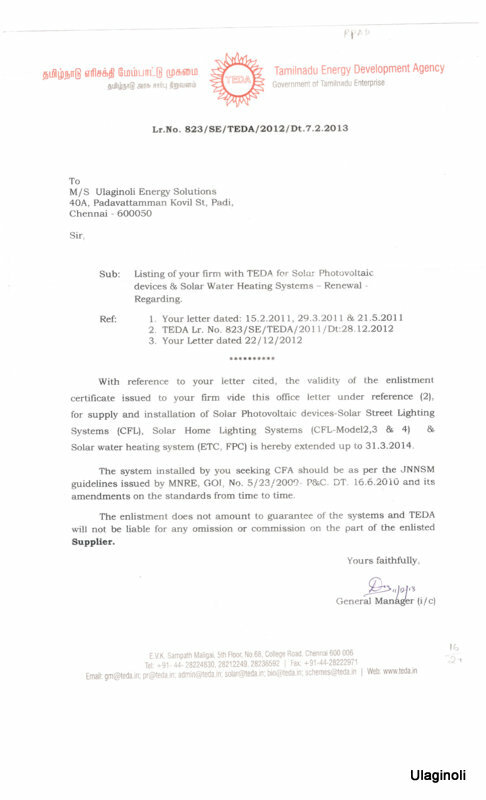 The Tamil Nadu Energy Development Agency (TEDA) has extended the validity of the Enlistment Certificate till 31.3.2014. This enables the projects executed by Ulaginoli Energy Solutions to avail the subsidy from the Central govt. of India. With the Govt. of Tamil Nadu announcing various schemes for both domestic as well commercial consumers to combat power outages, Ulaginoli Energy Solutions is is ever prepared to fulfill its vision of delivering green and energy efficient solutions to solve global energy crisis.